On Wednesday, March 20, at the end of the day customers EURUSD closed the day rising above 1.14. Maximum fixed at 1.1448. The dollar fell to the US session after the announcement of FOMC decision and the publication accompanying statement. Speculators have received from the Fed indicate the dollar sale. Following the results of the two-day meeting of the regulator kept the interest rate in the range of 2,25-2,5% per annum. The accompanying statement was softer than expected by market participants. Worsened outlook for US economic growth and inflation in 2019 and 2020. For the current year growth dropped from 2.3% to 2.1% next year - from 2% to 1.9%. The collapse caused point FOMC (dot plots). They show the opinion of the members of the Federal Reserve on future rate hike. So, they believe that rates will remain once in 2020 at current levels until the end of the year and will be increased. The central bank also plans to complete the process of balance sheet contraction by the end of September this year. The yield on 10-year US government bonds fell by 1.94% to 2.97% per annum. Against this background, all the major currencies strengthened against the US dollar. At 11:30, the SNB will announce rate decision at 12:00 - will hold a press conference. At 12:00 in the euro zone will be released by the Economic Bulletin of the ECB. At 12:30 Britain will publish data on changes in retail sales and the net borrowing of the public sector in February. At 15:00, the Bank of England will announce interest rate decision, the volume of asset purchases and how to distribute the voice rate. At 15:30 Canada will declare a change of wholesale trade volume in January. US - Philadelphia Fed will release manufacturing index and report on changes in the number of initial applications for unemployment benefits. At 18:00, the euro zone will release consumer confidence index for March. At auction in Europe, a false breakout of the trend line has been fixed again. 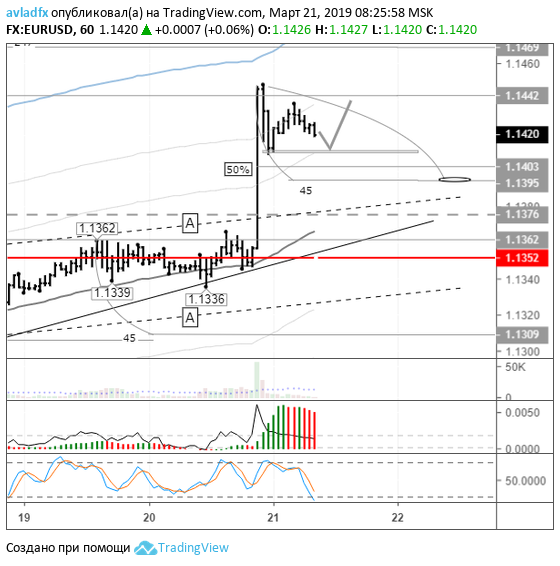 EURUSD course went up to 1.1336 and bounced up sharply. To target 1.1325 did not reach 11 points. Against the backdrop of the collapse of the British pound and the growth of cross-pair EUR / GBP EUR / USD pair has updated max. Before the announcement of the decision buyers EURUSD did not break through the resistance of 1.1360. The Fed surprised everyone with his "pigeon rhetoric." Dollar fell into a depression. This year, the rate hike will not. for US GDP growth forecasts lowered. Central Bank plans to complete the process of reducing the balance by the end of September this year. Market sentiment in the market deteriorated in relation to the US dollar. On the chart EURUSD recovered 50% of its volume candles. The level of 1.1403 is the reference point. If EURUSD falls below it, the sellers will start to bring down the price up to 45 degrees. Slow path I showed blockage arc. Given that all the currencies and many crosses with the euro are in positive territory, the likely rebound double bottom. If the pressure on the dollar strengthened, the evrobyki may jerk to 1.1480. Upon reaching the line U3 is not expected rebound down and saw movement under the U3 line. Monthly candle at the moment generates a buy signal EURUSD. Until its closure left 6 days. The purpose of the annual forecast by early June remains at 1.23. On Thursday, the center of attention - meeting of the Bank of England.